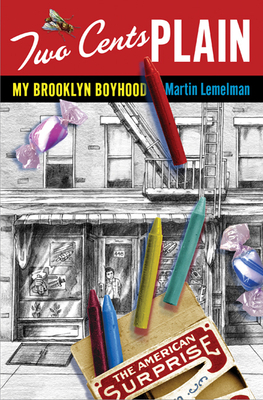 Martin Lemelman's elegiac and bittersweet graphic memoir "Two Cents Plain" collects the memories and artifacts of the author's childhood in Brooklyn. The son of Holocaust survivors, Lemelman grew up in the back of his family's candy store in Brownsville during the 1950s and '60s, as the neighborhood, and much of the city, moved into a period of deep decline. In "Two Cents Plain," Lemelman pieces together the fragments of his past in an effort to come to terms with a childhood that was marked by struggle both in and outside of the home. But his was not a childhood wholly without its pleasures. Lemelman's Brooklyn is also the nostalgic place of egg creams and comic books, malteds and novelty toys, where the voices of Brownsville's denizens the deli man, the fish man, and the fruit man all come to vivid life. Between the lingering strains of the Holocaust and the increasing violence on the city's streets, "Two Cents Plain" reaches its dramatic climax in 1968, as Lemelman's worlds explode, forcing him and his family to re-create their lives. Through his stirring narrative and richly rendered black-and-white drawings, family photographs, and found objects, Lemelman creates a lush, layered view of a long-lost time and place, the chronicle of a family and a city in crisis. "Two Cents Plain" is a wholly unique memoir and a reading experience not soon forgotten. Martin Lemelman is the author/illustrator of Mendel's Daugher and has illustrated over 30 children's books, and his work has been published in magazines ranging from the New York Times Book Review to Sesame Street magazine. A professor in the Communication Design Department at Kutztown University, he lives in Allentown, Pennsylvania with his wife, Monica, and is the father of four sons. The author, Martin Lemelman, chooses to tell much of the story in the voices of his deceased parents. Why does he make this choice? Do you think that he interviewed them in advance or just imagined what they would have to say? Do you think it’s effective? Martin writes that his parents fought bitterly every day. Gusta and Tovia married shortly after they met, and Gusta claims that “Even before the words came out from my mouth, I was thinking, ‘Did I make a big mistake?’” (32). Do you think that she truly felt this way in 1946, or that her impression has changed over time? How and why did Gusta and Tovia’s relationship change after their move to America? When Gusta and Tovia met in Neu Friemann, Tovia called Gusta’s cooking “a taste of Paradise” (31). But by the 1950s, Martin says that the only fuel Tovia needed was rage. What changes for Tovia? Why does he hurl Gusta’s verenikas to the ground on page 204? Looking back, Gusta tells Martin: “One word from you and Boynat—just one word and your father would have been good to me . . . Why you boys couldn’t help me, I don’t know” (205). Does Gusta really believe this? Does Martin think that he could have done anything differently? Still, Gusta claims, “Even with all our fighting, with all the anger and the bad words, still your father loved me” (305). How did Tovia show his love? Tovia fought in the Soviet army for five years. He idolized Stalin. “He knows what’s good for the Russian peoples. He is like a father!” Tovia claims (90). Why did he remain so loyal to Russia even after Stalin signed an agreement with Hitler? Would things really have been better for Tovia if he had stayed in Russia? The author’s relationship with Tovia is complicated. Did Martin love Tovia? In 1982, Tovia finally tells Martin what he thinks about his art. “When will you stop this nonsense?” he asks (192). At this time, Martin is thirty-two years old. How do you think this comment affects Martin? Gusta grew up in a very different world from the one in which she raised a family. How did her homeland influence how she raised the children? Does Martin believe in the magic that Gusta had so much faith in? Was Gusta a good mother to her sons? Would her parenting methods be acceptable today? Gusta tried to live in the present, while Tovia was caught in the past. Did this affect their ability to relate to each another? Did this cause Tovia and Gusta to have differing perspectives on work? Tovia believed that Gusta was no help around the store, yet Martin describes her as constantly working and cooking. If she was as helpful as Martin remembers, why couldn’t Tovia appreciate her work? Martin calls the candy store his father’s “livelihood and his grave” (124). Why did it become so hard for Tovia to leave the store? In Poland, Tovia had success as the manager of a mill: “People was treating me with respect” (45). Is this past success the reason why Tovia never felt satisfied with his life in America? In 1947, Gusta comes to America seeking not wealth but only to live a normal life; this was her American dream. How has the idea of the American dream changed since 1947? Do natural-born American citizens have an American Dream different from Gusta’s or from immigrants in general? The generation that Gusta and Tovia were a part of survived unspeakable pain to begin new life in America. Is it possible to achieve a normal life after going through what Gusta and Tovia suffered in Poland? Would today’s youth survive and struggle on the way Gusta and Tovia’s generation did, or did the older generation have an inner strength that we may not see today? How have generations changed? After all that they had gone through together, why did Gusta sever ties with Simon, Isia, and Yetala? What was the “coldness” (120) that Isia felt from Tovia? Was Gusta really too embarrassed by her living conditions to invite her siblings over, or was it something else? Martin writes that he heard his parents fighting about his aunt and uncles. Is it possible that Tovia resented the relationship that Gusta had with her siblings because none of his own family remained? What is the significance of the letter from the Lemelman’s attorney to the IRS? Martin says that his parents worked day in and day out with no vacations. Do you think it was difficult to live at that time on three thousand dollars a year? Was Martin pointing out the irony of such hard work with so little financial payoff? Is this typical for people just starting out in a new country? In 1960, Brownsville had begun to change. New waves of immigrants, both black and Hispanic, began to move into the once-Jewish neighborhood. How was this new wave similar to Tovia and Gusta’s generation? In what ways were they different? When Tovia and Gusta arrived, did they, too, displace an older generation of immigrants? Is this a normal cycle in American cities? Soon, Martin writes, it wasn’t safe to walk the streets as a Jew. Tovia’s store was being robbed constantly. Why didn’t he abandon the store and start anew? Was the racism that Martin faced as a child similar to what his parents went through in Poland? Did the anti-Semitism that the Lemelmans faced in the 1960s permanently change their perception of America? Does America deliver on the dream it promises? Why does the author return to Brownsville, first in October 1978 and then again in September 2009? Does he expect to find answers in the ruins, or a sense of closure? On both occasions he describes “a boy, not me, looking up at the sky.” What is the boy’s significance to the author? Is this the child of a new generation of immigrants? Can Martin see his own history in this child? Overall, does Martin have a positive or negative impression of his boyhood?